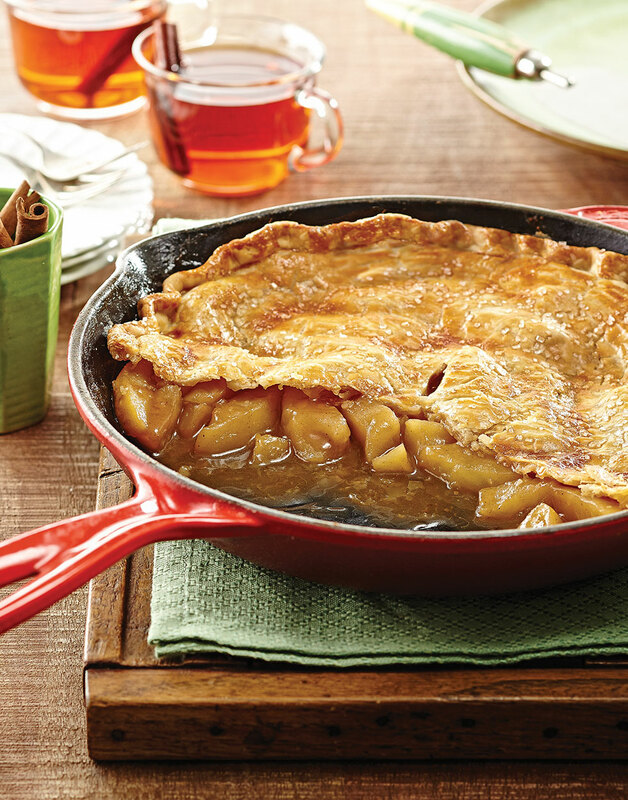 Satisfy your apple pie cravings with this quick and easy Skillet Apple Pie. Using your favorite purchased pie dough and a quick sauté of apples, this pie will be on your table and done in under an hour. And, check out this quick tip on preventing cut apples from browning. Melt butter in a 10-inch cast-iron skillet over medium heat. Add apples and brown sugar and sauté until apples begin to soften, about 5 minutes; reduce heat to low. Stir in zest, cinnamon, and salt. Whisk together cider, lemon juice, and cornstarch. Stir into apples and cook until thick and glossy, 3–5 minutes. Off heat, spread filling into an even layer in skillet and cool, at least 10 minutes. Unroll pie crust over apple mixture and crimp edges around skillet. Brush dough with egg, sprinkle with sanding sugar, and cut 4–5 steam vents in the center. Bake pie until crust is golden brown and filling is bubbly, 35 minutes, rotating halfway through. Let pie cool to room temperature before serving. To jump start the process, without overcooking the apples, quickly sauté them before adding the slurry.